Are you an audiophile? Or do you have an insatiable love for sound? A career as an Audio Engineer may be the path for you. Audio engineers operate computers and electrical equipment in order to record, mix, and reproduce sounds for various entertainment mediums. They are responsible for the music and sounds that people hear on a regular basis on the radio, TV, and on the Internet. Are you ready for a highly technical career? Do you have good listening skills to distinguish and manipulate sounds? Finally, do you have the interpersonal skills necessary to work closely with clients and deliver high-quality work? If you find yourself agreeing with those assessments, follow this LYL guide to land your career as an Audio Engineer. According to the U.S. Bureau of Labor Statistics (BLS) audio engineers typically need post-secondary education, be it a non-degree award or an associate’s degree, to qualify for most jobs within the field. Aspiring audio engineers should complete high school courses in electronics, math, physics, and IT before embarking on post-secondary work. In some cases, they can be eligible for entry-level positions with a high school diploma. Prospective students can choose to complete certificates, associate’s degrees, or bachelor’s degrees in audio production. Audio post-secondary non-degree programs typically take several months to a year to complete. They include theoretical work and hands-on experience with audio engineer equipment. Coursework in these programs is generally comprised of music theory, studio recording, and sound perception. Students taking advanced classes can choose to complete design projects and internships in order to have a competitive advantage once the degree is completed. Since technology is constantly improving, audio engineers need to stay on top of the latest equipment and techniques. BLS recognizes the need for engineers to enroll in continuing education programs in order to receive the necessary training to keep up with new equipment and hardware. These programs typically last 6 months. The U.S. Bureau of Labor Statistics (BLS) recognizes that audio engineers work at a variety of places, including recording studios, sporting arenas, theater productions, and movie and video productions. They can also serve as consultant engineers, who work outside of studios or provide specializations in select fields, like acoustical sounds, broadcast engineering, and sound reinforcement. Audio engineers operate and maintain sound equipment in order to record, synchronize, mix, and reproduce sounds. Some of their projects could be music related, in which case they’ll need to manage voice, sound, acoustic, and electronic sound systems. Other jobs could be independent creations, where they record different sounds and combine tracks to create multi-layered, finished products. Audio engineers operate a variety of sound and electrical equipment. For instance, they may use soundboards and transmitters to broadcast radio and TV programs, and switch to computer software to edit sound recordings. What Does an Average Day For An Audio Engineer Look Like? An average day for an audio engineer can encompass a number of duties. Most audio engineers begin their day or project setting up their equipment. This can include setting up and testing soundboards, microphones, and headsets. If they’re working an event, audio engineers would need to set up equipment for live performances. They’d also need to set up equipment that can minimize unwanted sounds on set. Their other responsibilities include installing audio, video, and sometimes even lighting equipment at the designated venues. Audio engineers have consultation-like appointments with their clients in order to understand the project and ensure both parties are on the same page. They then collaborate with key individuals on their team to attain the desired sound for production. This team could comprise producers and performers, members who play pivotal roles in the audio’s finished sounds. During recording sessions, audio engineers record speech, music, and other sounds using their recording equipment and intricate computer software. While recording these sounds, audio engineers regulate volume levels and sound qualities, and adjust these elements accordingly. During live shows and events, audio engineers are also on call to troubleshoot immerging sound issues. Once the recording phase has been completed, audio engineers process the raw sounds to meet quality standards. If necessary, they’ll convert audio data to digital formats for computer editing purposes. For visual productions, audio engineers synchronize the processed sounds with dialogue and actions present in the videos. Once finished, audio engineers will share the finished products with their team members and clients. If any changes need to be made, the audio engineer dutifully continues processing the audio until all parties are satisfied with the end result. Audio engineers are responsible for maintaining and repairing the equipment they operate. They must keep detailed records of the recordings done and the equipment used. If they discover major issues with the equipment, they’re responsible for reporting the problems and getting them fixed. 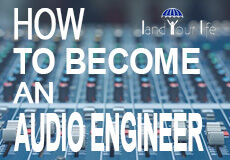 Are You Suited for an Audio Engineer Career? Audio engineers possess a combination of key personality traits and skills that make them remarkable at what they do. They have great communication skills, so that they can communicate with their team members, to ensure that their clients’ needs are met. They also communicate with their clients in a friendly and professional manner, in order to please them and attain a high customer retention rate. Communication with other staff members also ensures the seamless set up and operation of all equipment, which makes working major events and productions a smooth and effortless process. Audio engineers also have the manual dexterity, steady hand, and hand-eye coordination needed to master their audio equipment by adjusting dials, knobs and sliders. Without these three skills can greatly undermine their work, especially during live performances and broadcasts. Last but not least, audio engineers need to have problem-solving skills. Since they’re expected to identify equipment or sound problems, they’re also expected to provide possible solutions to these issues for their clients and team members. Audio engineers must be proficient in intricate computer software. Since they use computer systems to program their equipment and edit audio recordings, they’ll need to have the proper computer skills to master this part of their career. While most employers don’t require certifications, some audio engineers choose to earn certifications to gain a competitive advantage in the job market. According to the BLS, certifications can inform employers of the candidate’s advanced proficiencies and expertise in new technologies. Audio engineers interested in gaining certification can often do so through their postsecondary program or by participating in trainings conducted by audio engineering societies. Certifications usually involve the successful completion of a course and an exam. How Does An Audio Engineer Find Work? Internships allow aspiring audio engineers to make connections and network with potential employers. But the best way to finding a job as an audio engineer is to join professional affiliations and look through their job databases. The Audio Engineering Society, for instance, provides a list of jobs within the audio engineering fields. Additionally, audio engineers should take advantage of their post-secondary school’s job placement programs. A lot of them show success rates with helping students find jobs. The Recording Connection, for example, boasts that 72% of its graduates land a job in the music or recording industry, either before or right after they graduate. In 2017, the U.S. Bureau of Labor Statistics (BLS) reported that sound engineering technicians earn an average yearly salary of $68,180. The top 10% in the field can expect to earn average yearly salaries of $125,230, while the bottom 10% earn, on average, $25,880. Audio engineers living in California, New York, Utah, Tennessee, and Louisiana reside in the country’s top paying states for this occupation. One primary tip is to earn certification in the field. While not required by most employers, the BLS reports that certifications could give candidates a competitive edge as large stations tend to value audio engineers with more specialized skills. To qualify for managerial roles, such as chief engineer positions at large stations, audio engineers should consider attaining a bachelor’s degree in engineering or computer science. Another great tip to earn higher salaries is to seek jobs in industries that are known for paying more. The BLS reports that audio engineers who work in software publishers; motion picture and video industries; and computer systems design and related services make an annual yearly salary of $89,220 to $94,570. According to the U.S. Bureau of Labor Statistics, the employment of broadcast and sound engineering technicians is projected to grow 8% from 2016 to 2026. That is about as fast as average for all occupations. This growth is expected to be seen in businesses, schools, and radio and television stations. Manage the audio for movies and videos within this industry. Audio engineers set up their equipment; record sounds and voices; mix tracks; and finally synchronize audio with the videos’ dialogue and action. Individuals with extensive experience in the field are likely to get these roles. Additionally, audio engineers who have video editing skills and a love for movies are also suited for the job. Conduct recording, mixing and processing audio services for sound recording industries. Audio engineers in these roles can usually be found at music production companies or studios. Experienced professionals are well suited for these positions. Individuals with interpersonal and communication skills are also likely to excel in these positions since it requires working with producers and performers. Manage the audio for radio and televisions broadcasts. Engineers in these positions generally need to operate transmitters to broadcast programs and use computer software to edit video and audio recordings. Candidates specializing in broadcasting are suited for the positions, especially if they are experienced professionals. For live radio and television broadcasts, engineers will need to be quick problem solvers to troubleshoot issues as they arise. Record, synchronize and playback audio for live theater performances. Audio engineers also need to be on hand to adjust volume levels and sound qualities during the live performance. Candidates for this position must have experience in live events, preferably related to theater. They’ll also need to be quick on their feet to troubleshoot any audio problems. Work with private clients to bring their music and other sound-related dreams to life. Audio professions work closely with independent artists to record, mix, and finalize sounds. Experienced engineers are suited for the position but they must also have great communication and listening skills. Since they’ll mostly be working with clients, one-on-one, they’ll need to know how to listen well and communicate concerns, so as to satisfy their clients’ needs.